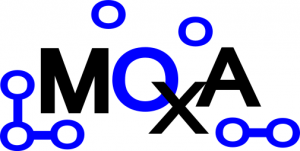 MOXA @ Rexus16 experiment – The students MOXA Team for the REXUS 15/16 rocket project at the University of Technology Dresden launched in May 2014. Our goal was the measurement of ozone and oxygen in the lower atmosphere. This website is dedicated to the students project Measuring Ozone and OXygen in the Atmosphere, which was part of the REXUS15/16 campaign. The campaign took place from November 2012 – June 2014 and involved a team of more than 20 people from the University of Technology Dresden. The experiment measured the partial pressures of atomic oxygen, molecular oxygen, carbon dioxide and ozone. The sensors were developed at the University of Technology Dresden (TU Dresden) in Germany; the FIPEX sensors (atomic oxygen) were already used for measurements in the low earth orbit (LEO) on the International Space Station in 2008. Especially atomic oxygen is a very important issue in modern space sciences as it is an aggressive corrosive.MOXA is a precursor experiment for the Cube50 project. In this project, 50 picosattelites with a size of only 10x10x10cm³ which will be developed by students and universities all around the globe, will be launched. 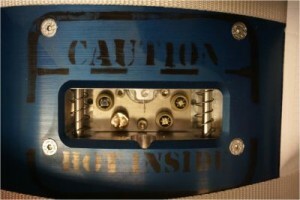 One of their three payloads will be FIPEX sensors. The launch of QB50 is currently scheduled for 2015. The complete Rexus15/16 launch team. 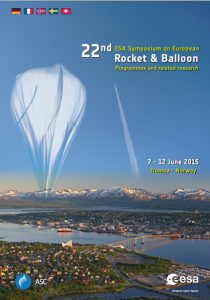 The launch of our experiment from the only european rocket base in Kiruna (Sweden) took place May 14.th 2014. The REXUS rocket reached an altitude of approximately 100 km (Kármán-Line) and allowed us to measure residual gases in the atmosphere layers between 0-100 km above the ground, the Mesosphere and the Stratosphere. The launch in Kiruna in May 2014 involved many different teams with experiments from different science fields. It was a great experience and we encourage anyone who has the chance to participate in such a project to take a chance! For news about Rexus and Bexus follow their new website. Open calls for proposals for both projects are once or twice a year and give you the opportunity to take part! We have presented our results at the 22nd ESA PAC Symposium on European Rocket and Balloon Programmes with great success in front of an international comittee of experts and fellow REXUS students. This represents the final step of our 2 1/2 year long joint efforts of our rocket project. The symposium places in Tromso, Norway, which is the city with the northmost university and provides a spectacular midnight sun as we could already experience at the launch site in Kiruna. 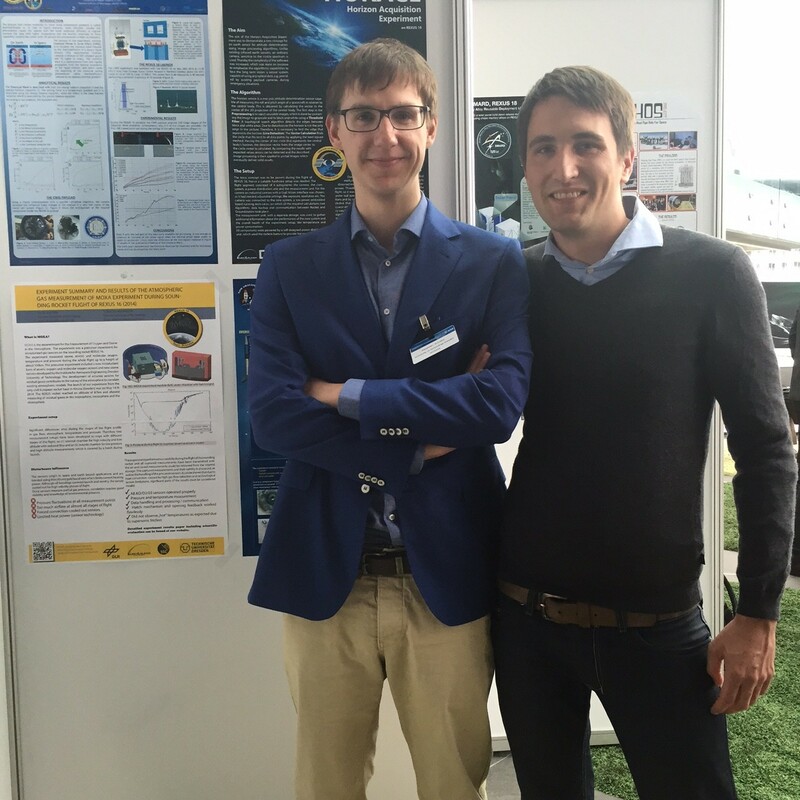 Two members of the team, Bastian Klose and Alexander Schultze, were selected to give the presentation on behalf of the team. 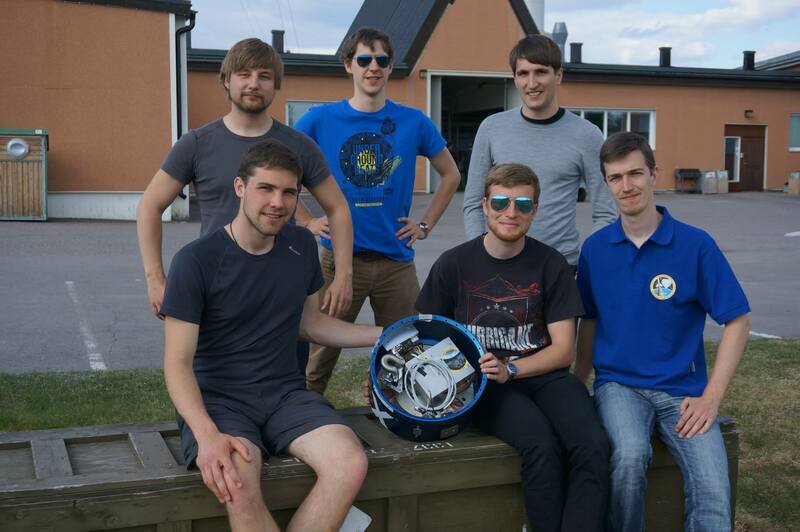 The launch of the Rexus 16 from Kiruna on 14.05.2014 was a full success for the experiment and our team! Everybody was excited to see the rocket actually launch and monitor the live results and the livestream camera mounted to the rocket. 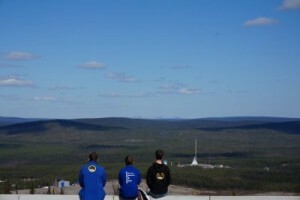 Three teammembers observing launch from Radar hill at Esrange. The launch campaign team (2014) with the recovered rocket experiment module. You can see the full launch campaign foto album here and a video (recorded by other teams) here. Our experiment was in science, technology and teamwork a big success. We were able to show that the miniaturized sensors survive the rough rocket launch conditions and work properly in near vacuum. The experiment module with hatch after retrieval. All experiment requirements have been fulfilled! The German Aerospace Center (DLR) has greatly improved the website on the REXUS project. Now you can find there more detailled technical information as well as two videos of launch and recovery of a previous REXUS mission! 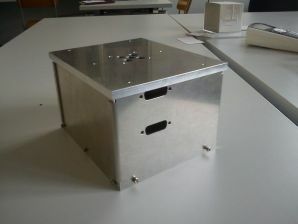 Electronics box for inside of experiment. This is our box for all the boards we need. It is easy to demount in case we have to work on the boards very fast. They regulate the power, controll heating of the sensors and handle the measured data. It sounds simple, but it took a long time to design the PCBs (Printed Circuit Boards). After that there was a loop of testing and redesigning pass trough to come to the current design. The blue eloxated rocket experiment module. Our experiment module, provided by the DLR, has arrived in Dresden. 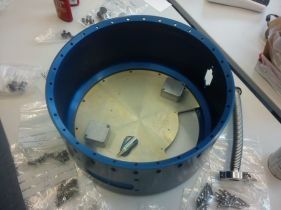 We are going to re-use the bulkhead from the previous TUD Rexus team, CaRu. CaRu was launched on Rexus 11 and researched the influence of milligravity on the creation of Runge pictures, which come to live through the combined effects of capillarity and a chemical precipitate reaction. We are currently waiting for some manufacturing parts from the TU workshop and the delivery of several commercially available parts. After all necessary elements are assembled, the vibration test will be performed under Nathanael’s management. Due to the fact that some critical components are vertically arranged within the module, they are susceptible to vibrations during takeoff. It is necessary to ensure that these parts are not excited at their resonance frequency. We plan to measure the resonance frequency of this component, therefore we need to place several sensors at specific positions of our module. On 11. september we had our IPR (Integration Progress Review). 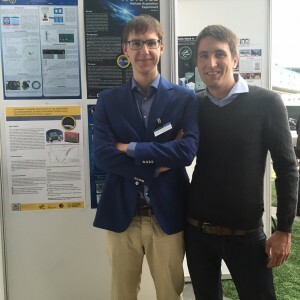 First the team leader Alexander Mager and Bastian Klose (responsible person of electronics) had a talk about the current status of our experiment and what we planned to do next. After the visitors Dieter Bischoff and Simon Mawn from ZARM and Alexander Schmidt from DLR-Moraba introduce themselves, we discussed the project status. So we could report that all prefabricated parts and boards of electronics are ordered and a critical vacuum test is realised. The next time the placement is going to starts and the complete system should going to be tested. 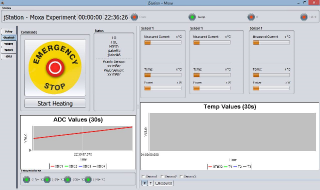 Also the software is as far as complete and tested except the test for the software code with the complete hardware and the communication between software and Rexus-Service module. The drawings of our mechanics part are delivered to the fabrication. Next we are going to assemble all parts and going to test the function. In addition we are going to make some vacuum, vibration and thermal tests. Currently, the launch campaign has been scheduled for May 2014! Meeting of mechanical design team. The development of our software has been under great progress. With this groundstation we can test our electronic components. This interface is as well important for our launch campain. We can see if the sensors work correct, if the Hatch opens correctly and can see all values of the temperature and pressure sensors. Early design of GSE Groundstation software. Also the Microcontroller Software, written in pure ANSI-C, has done great progress. Altough there is not much more to see than blinking lights at this point, you can see the development using the IDE (CoIDE) for the Microcontroller we choose, an STM32F103 with 72 MHz. Software IDE for Low Level development. 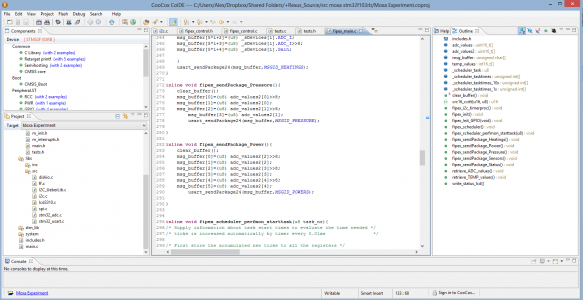 Design of control loop for heating sensors in Matlab/Simulink. Of course it is necessary to simulate the environment to adjust the experiment parameters. 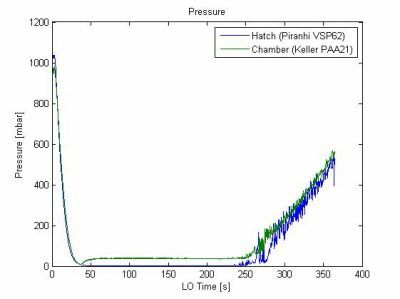 A simulation using SimuLink has been performed to analyze the heat loss of the sensors during flight to determine the correct control parameters. We will most likely use a PID control. All software from this project is licensed under a Creative Commons license. Why? To support fellow and future Rexus Teams.